Did you know that there are 65 mammal species in The Great Smoky Mountains National Park? The most famous, of course, is the black bear, but we also have elk, red and grey foxes, raccoons, river otters, raccoons, and more. 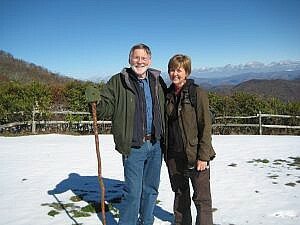 We are extremely blessed to have the experts on southern Appalachian mammals, Dr. Michael Pelton and Dr. Tamra Willis, back at The Swag this season to serve as Event Leaders, and we are looking forward to welcoming them back for Thanksgiving week. Michael Pelton is Emeritus Professor of Wildlife Science in the Department of Forestry, Wildlife and Fisheries at the University of Tennessee is the foremost expert on the black bear in the world. His research, among “the most ambitious ever undertaking in the eastern U.S., lasted 41 years to become the longest continuous study of any bear species conducted anywhere in the world.” In addition to the black bear, Michael has researched giant pandas in China, brown bears in Spain, Andean bears in South America, and Asiatic black bears in Japan. 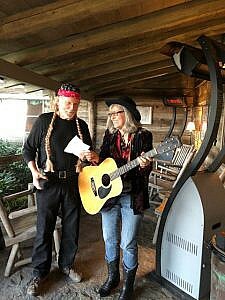 Michael and Tamra dressed as Willie Nelson and Emmylou Harris for Halloween. Tamra Willis, Michael’s wife, has serves as the associate professor in Graduate Teacher Education Program at Mary Baldwin University, where she directed the Environment-Based Learning program. Over her career she has served as an elementary classroom teacher, science coordinator, and environmental educator. Tamra’s area of interest include snakes, bats, and insects. Michael and Tamra now live on a farm in Virginia. We were lucky to have Michael and Tamra with us for our Halloween celebration. Although their status as Event Leaders disqualified them from taking home one of the prizes in the costume contest, Willie Nelson and Emmylou Harris would have been tough to beat otherwise! If you love hiking or learning about the Great Smoky Mountains National Park, you will want to come spend time at The Swag with Michael and Tamra. Book your room now!